Google Translate is a free multilingual machine translation service developed by Google, to translate the text. They provide a website interface, mobile apps for Android and iOS. The developer can use Google API to build browser extensions and software applications. 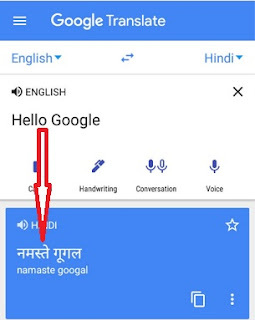 Google Translate supports over 100 languages. Rather than translating languages directly, it first translates text to English and then to the target language. If you want you can type the English word and translate it. In addition, it will have the option of handwriting recognition translation, voice translation, and image translation. As soon as you start the image translation feature, the camera of your phone starts working as a magical translator. After tapping on the camera, you will first need to download the instant camera language. • You Can Translate between more than 100 languages by typing. • Instant camera translation: Use your camera to translate text instantly in 38 languages. • Using Tap to Translate Language: Copy text in any app and your translation pops up. • Translate Offline: You Can Translate 59 languages when you have no Internet. • You Can Use Camera Mode: Take pictures of text for higher-quality translations in 37 languages. • Provide Handwriting: Draw characters instead of using the keyboard in 93 languages. • Phrasebook: Star and save translations for future reference in any language.